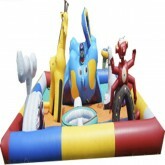 Miami Party Supply Carries some of the best Toddler Inflatables in Miami! 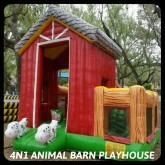 From Toddler Stations, Toddler Zones, Toddler Kiddie Zoos, Merry Go Rounds, and a super cute Animal Barn Playhouse! Toddler Attractions There are 5 products. Watch out folks...There's a big party in the barn and all the Animals are showing up for the hoedown! 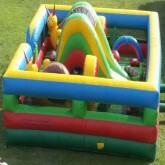 The Toddler Station is Miami's favorite Toddler Inflatable rental! It's got everything you need to entertain a bunch of toddlers together for several hours! Monkeying around is serious business for toddlers! So we would love to introduce to you the Monkey Business Toddler Zone Rental in Miami! 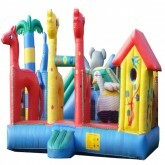 Our Inflatable Toddler Kiddie Zoo is perfect for Toddlers up to 3 Years of age! 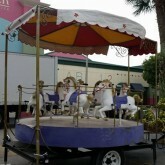 We carry the cuttest Merry Go Round Rentals in Miami! Our Carousel Rental carries 7 horses for toddlers to ride on!